John Smith was one of the foremost leaders of early Jamestown. He’d had an interesting life before that, one which influenced the direction of this country and (as I seem to be constantly promising) which will be explored later in this blog. He was a controversial but effective leader in the settlement’s first years, and when health problems and an injury prompted his return to England in 1609, he spent his time working for the colony from there, promoting it and encouraging people to move there. One of the ways he did this was by publishing a pamphlet with a description of the area and its novelties. 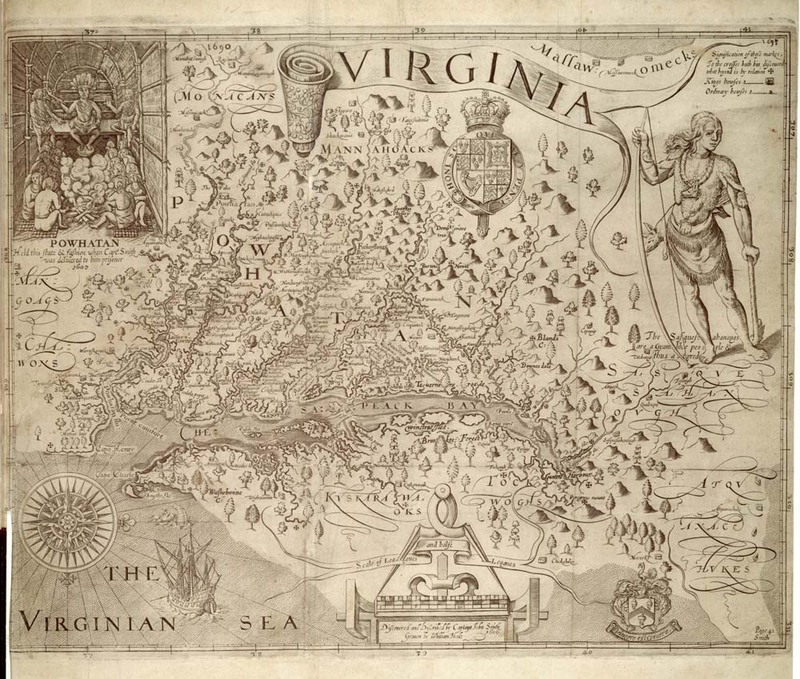 His Map of Virginia, with a Description of the Countrey, the Commodities, People, Government and Religion was published in 1612, and along with a map and description, also included a brief list of translations to the Algonquin language. It’s as fun to read now as it must have been back then, not because everything is so new and exotic, but the opposite. Many of the things and place names are instantly recognizable. I’ll just give you my two favorites, and leave you to browse the rest yourself. It’s not too long, and is surprisingly readable for something written in the 1600s. Plumbs there are of 3 sorts. The red and white are like our hedge plumbs: but the other, which they call Putchamins, grow as high as a Palmeta. The fruit is like a medler; it is first greene, then yellow, and red when it is ripe: if it be not ripe it will drawe a mans mouth awrie with much torment; but when it is ripe, it is as delicious as an Apricock. Their Beares are very little in comparison of those of Muscovia and Tartaria. The Beaver is as bigge as an ordinary water dogge, but his legges exceeding short. His fore feete like a dogs, his hinder feet like a Swans. His taile somewhat like the forme of a Racket bare without haire; which to eate, the Savages esteeme a great delicate. Just one more, and this time read the name of the animal out if you’re confused. There is a beast they call Aroughcun, much like a badger, but useth to live on trees as Squirrels doe. Yes, America is a wondrous place. This entry was posted in Articles, Culture, Education, Entertainment, History, Humor, Random, Stories and tagged American History, Colonial History, Jamestown Virginia, Virginia by STanksalvala. Bookmark the permalink. Perhaps it was in one of his treks across the Menokin Landscape (a significant place to the indigenous Algonquian people) that Smith made some of these observations.